Habit: Annual or perennial. I lerbs. shrubs, vines, or tree. Roots: Fibrous tap root often develops nodules in herbs. 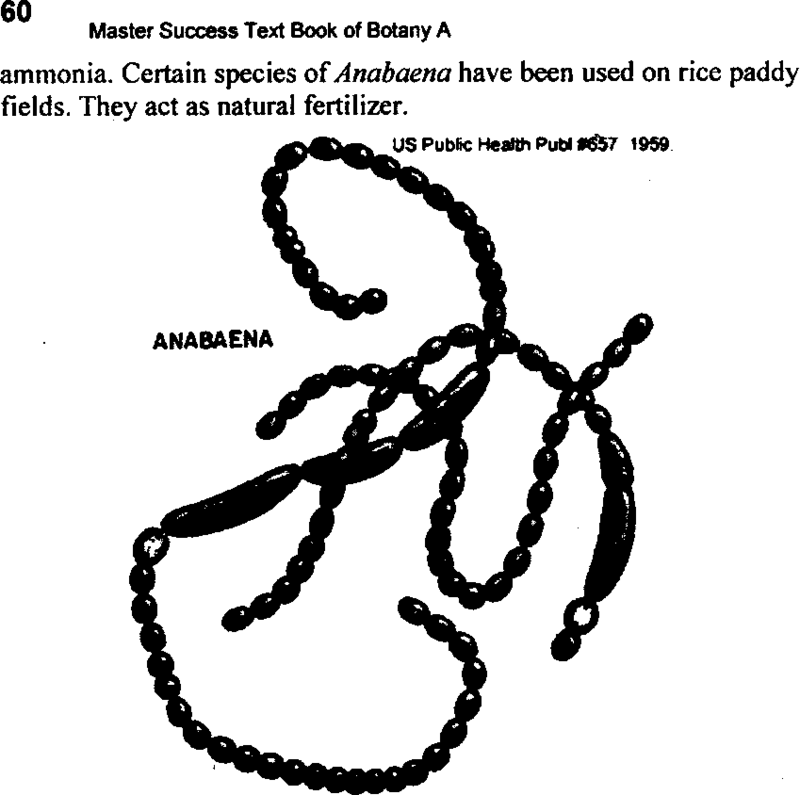 Nitrogen Fixing bacteria live in these nodules. Stem: Herbaceous or Moody; Cylindrical, tendril climbers. Leaves: Petiolate; alternate: compound of pinnate type. Stipulate, stipules may be modified into leaves or thrones; parallel venation. Inflorescence: Racemose or cymose, the flowers are clustered in heads. Carpel: Monocarpillary: ovary superior, placentation marginal. Fruits: Legume or sometimes. loment UM. 12. Seed: Non-endospermic seed. This sub-family has about 400 genera and 9000 species. The members of this family occur all over the world. particularly \A arm and temperate regions. Habit: These are trees. shrubs or herbs. Stem: It may be herbaceous. woody or climber with tendrils. Tendrils are wiry. coiled and thread like structure. Leaves: They have compound (rarely simple), alternate and stipulate leaves. The stipules are mostly leafy. Sometimes, these leaves are partially or completely modified into tendrils. Inflorescence: It may be Racemose or solitary axillary. Flowers: They have bisexual. zygomorphic, hracteate, pedicillate, perigynous. pentamerous and papilionaceous. Calyx: ‘They have 5 sepals These petals are mostly united to form tube. These are hairy. Corolla: They have papilionaceous corolla. 111 this case. there are 5 clawed petals. These petals are not similar. Standard or Vexillum: It is the upper posterior petal. It is large and conspicuous. Wings: These are two lateral free petals. Keel or Carina: These are two anterior most petals. They fuse to form a boat- shaped structure. Androecium: They have IC) mostly diadelphous stamens. The 9 stamens fused to form a sheath around the pistil. The posterior stamen is free. 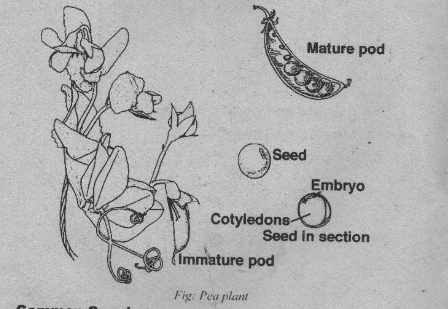 Gynoecium: It has simple pistil. This pistil has single carpel (monocarpellary) with single locule. the ovary is superior. The style is long bent at its base. The placentation is marginal. Fruit: Fruit is usually a legume or pod. Food: Most of the important pulses are belonged to this family. These pulses are used as food. Pulses are rich in proteins. The common species of pulses are Grain, Pea, and Kidney bean. Fodders: Medicago sativa (Alfalfa) is one of the best forage crops. Vicia Melilotu and Trifolium are also cultivated as main fodder crops. Timber: Many plant of this family provide timber for building furniture and fuel. Main timber plants are Butea, Dalbergia etc. Vegetable oil: The seed of Archis hypogea (peanut) are edible. They are also used for extraction of peanut oil. This peanut oil is hydrogenated and used as vegetable oil. Dyes: Some of its plants give yellow and indigo dyes. is used for cough and cold. Clitoria ternatea is use against snake bite. Ornamental plants: Some important ornamental plants are Lathyrus (pea), Lupinus, Clitoria, Butea etc. This family has 152 genera and 2300 species. It has 16 genera and 60 species in Pakistan. Stem: It is erect, woody herbaceous or climbing. Fruit: Its fruit is legume. Cytmetera. This oil is applied externally for skin diseases. 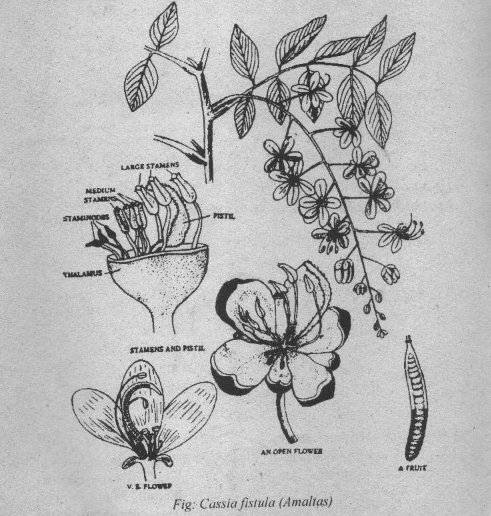 Vegetables and fruits: 1–he leaves and flower bud of Bauhinia variegate are used as vegetable. 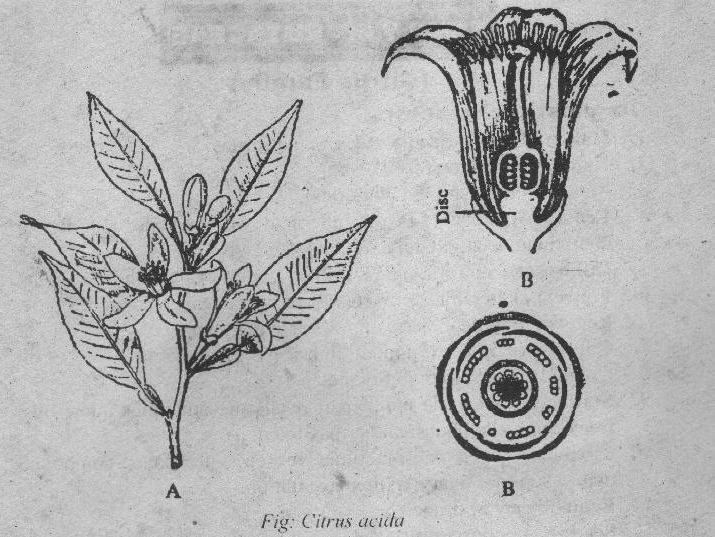 The acidic fruit of Tamarintlus indica (JIM) are edible. It is rich in tartaric acid. Tanning and dyes: The bark of Buahinia and Tamarindus indica is used in tanning. Habit: Mosly trees or shrubs. Rarely climbers or herbs. Most of them are xecophytes. Leaves: They have pinnate, compound, alternate and stipulate leaves. The stipules are modified into thrones. Inflorescence: It is spike like or head or umbel. It is rarely racemose or globose umbel. Flowers: The flower is bisexual, actinomorphic, hypogynous to slightly perigynous and bracteate. Calyx: They have 5 sepals. These sepals are fused. toothed or lobed. Corolla: They have 5 petals. These petals may be free or fused. Androecium: Stamens are live to numerous. They are free. adnate or attached totbase of corolla (epipetalous). Gynoecium: Thev have simple one carpel. Ovary is unilocular and superior. It has nianv Mlles. Placentation is marginal. Fruit: Fruit is a legume. The legume may be dehiscent or indehiseent. Wood: Many trees of this family provide commercially important wood, for example, Acacia, Albizzia and Xylia. Their wood is used for construction, for furniture or for fuel. Gum: Gum is obtained from Acacia nilotica and Acacia senegal. Dye: A dye Katha is obtained from Acacia catechu. Medicinal plants: The tender leaves of Acacia nilotica are used as blood purifier. Ornamental plants: Some common plants are grown for their beautiful flowers. 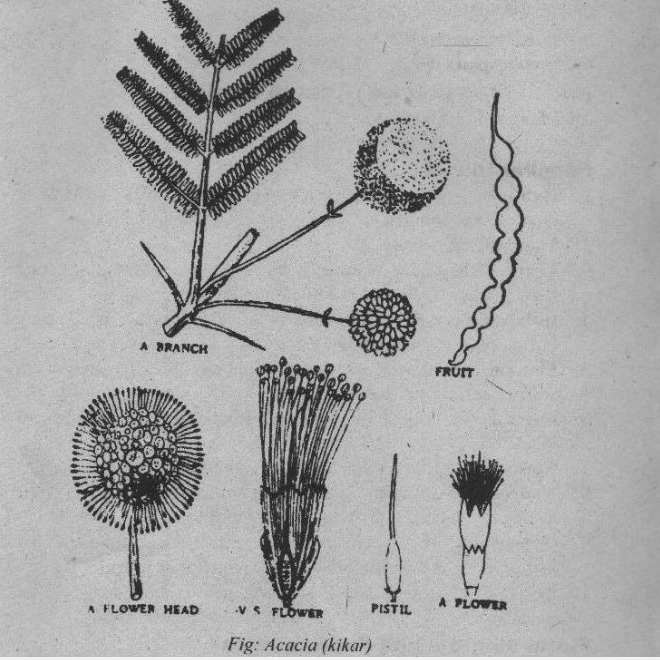 Some cf.these are Mimosa pudica and Acaciavmelanoxylon. Wind breaking: A few species of Prospis are planted in the arid zones for breaking the wind pressure. Mimosa pudica, Touch me not. What book are the images from? what is the best three character,that’s identify the family Fabaceae? very useful. but please rectify the spelling mistakes. and thank you. Which type of aestivation is more common in calyx of fabaceae family valvate or imbricate? “2. Stem: Herbaceous or Moody; Cylindrical, tendril climbers.” Moody and interesting characteristic!